so i decided to resurrect some old max files and put together a max - live - qc instrument. this started when i had no body to collaborate with and i decided i wanted my computer to play along with me. well now with the max - live integration i'm making this possible for everyone. i started with this in mind but now i'm more interested in not jamming but listening to the computer improvise. how does the computer predict the notes i was going to play ? no really that doesn't explain anything you input some notes via mouse or keyboard and then the computer calculates the probability of what you will play next based on a 3 note observation. how do i improvise with it? its best to just go crazy and play all kinds of riffs in and see what happens. the patch is quantized so that you can sync it. inquire for the experimental humanized version. please note all this audio is algorithmically generated. the only human interaction is to tell is to tell it what key top play. 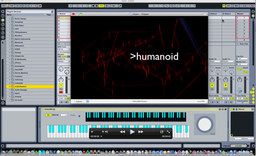 I have my eyes peeled for ways to visualize midi -- nice one... thanks for sharing.